Preheat oven to 400 degrees F. Sprinkle a 15x10 baking sheet with a pinch of flour or cornmeal to prevent dough from sticking if desired. Unroll dough onto baking sheet and press with fingertips, stretching dough to fit baking sheet. Bake uncovered for 8 minutes and remove from oven. For a crispier crust, bake an additional 2 minutes. Increase oven setting to 450 degrees F. Spread pasta sauce evenly on crust, leaving 1/2-in. around the edge. 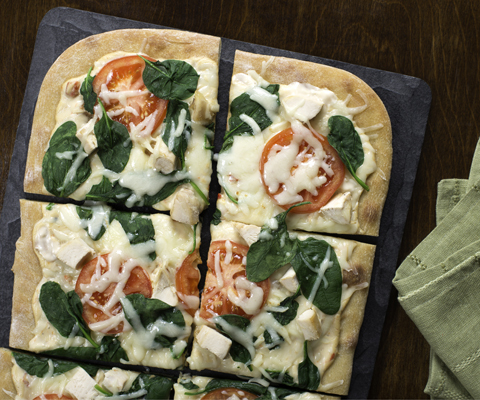 Arrange spinach, tomato slices and chicken on top, and sprinkle with cheese. Bake uncovered for 10 to 12 minutes or until cheese is melted and crust is golden brown. Allow to rest for 5 minutes and cut into 6 slices. If desired, substitute Classico Roasted Red Pepper Alfredo Pasta Sauce with Classico Four Cheese Alfredo Pasta Sauce. For added flavor, lightly drizzle tomato slices with Heinz Balsamic Vinegar before placing on pizza. If desired, sprinkle 1/2 cup of cooked and crumbled bacon on top.